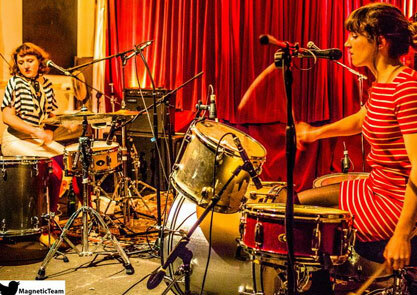 Rattle are a drumming duo based in Nottingham and comprised of Theresa J Wrigley (Highs) and Katharine Eira Brown (Lows). Both musicians also play drums for two other well respected bands, with Theresa in Fists and Katy in Kogumaza. Catch them playing on April 18th in Birmingham supporting The Ex on April 18th at Hare & Hounds. Tickets here. Far from the hippy bongo nightmare one might imagine from a band made up of only two drummers, Rattle instead play minimalist rhythms that remain both hypnotic and danceable heavily thanks to the delicate vocal melodies which accompany their beats. Their sound recalls This Heat or ESG whilst remaining uniquely their own. Really, it’s just so much easier for you to hear them for yourself. So why not take a look at this delightful video from the duo, for their song “It’s Starting”. You can see Rattle play supporting legendary Dutch band The Ex later this month at our gig on April 18th at Hare & Hounds.